Auto centers for car drivers, this was the idea which arose in the 80s. A lot of concepts were created in Germany at that time, but only five of them outlived. However, how does it look like in the remaining Europe? This question was followed up by the analysts of wolk after sales experts. 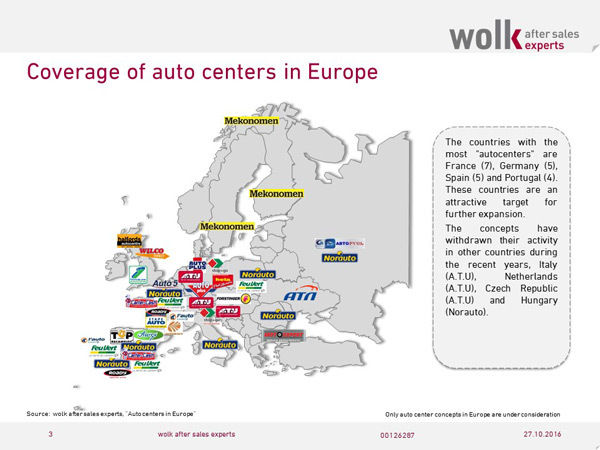 Their findings are published in the report „Auto centers in Europe “. The whole lot under one umbrella – this was the fundamental idea of auto center concepts. Car parts, accessories and repair services concentrated at a place comparable to a supermarket with an integrated cooking service for the customers. 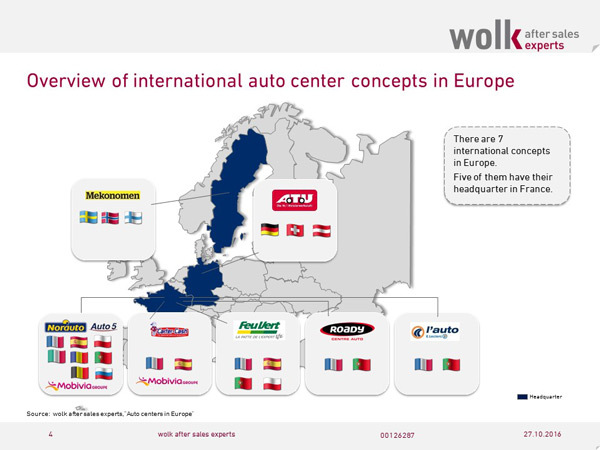 But the acceptance of the auto centers in Europe differs depending on country. While only one German concept A.T.U achieved national and international extension, French concepts such as Norauto or FeuVert take the leading position in France and other European countries, both in terms of the number of concepts (there are seven French concepts) and in terms of numbers of outlets (1.043). The concept of auto center is stretched to its limit in the case of such extremely sophisticated product as the car. The product range includes primarily products their fitting is rather uncomplicated, since the concept has been addressing the car drivers who should be routed via purchasing of the car parts and accessories to the integrated workshop. This is no surprise that almost each auto center concept extended its product range with bicycles, scooters or home and gardening products, like Wilco in the UK. The others accept restrictions similar to fast fitters, e.g. Formula One in the UK. But this is not the response to the question, why auto centers in France are a good deal more widespread as in other European countries. One reason for such their success story in France could be their spatial integration into the large shopping malls. An outlet of Norauto or FeuVert is always close to a shopping center and enables the customer to get an additional facet of his shopping experience. However, the auto center concepts skate on thin ice, because the product “car” has been developing to a driving computer and there is a decreasing number of opportunities for the car driver to fix something on his car by himself. The auto centers have been trying to accommodate this fact with different strategies. Some focus on online business (e.g. A.T.U), others promote their garage competence. The bottom line is that the idea of „the whole lot under one umbrella“ still lives on, but an upgrade or a reframing is desperately required. Profiles of 7 international and 15 national concepts with key data, structure of the product range, business model, standards, and SWOT analysis.